April 4, 2017 – An 18-storey wood building with a fire code that has left even fire chiefs impressed? That is what has been achieved in Vancouver at the University of British Columbia where mass timber was used to build the world’s tallest wooden building. Fire Fighting in Canada magazine’s feature on the project explains that the building is much taller than the six-storey limit for wooden buildings laid out by the National Building Code of Canada. The naturally fire resistant mass timber material used for it also requires its own permit. 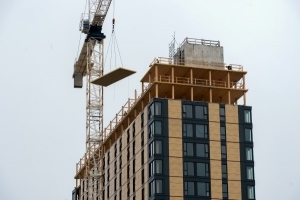 According to the article, the National Building Code of Canada may consider encapsulated mass timber wood construction of up to 12 storeys come 2020. “The building’s 169-millimetre-thick CLT panels, used for the floors, were constructed with five layers of dimensional lumber oriented at right angles to one another and then bonded together. Glulam, used in the columns, is also composed of bonded dimensional lumber, with the grain running parallel to the beam’s length,” the article reads. A fire demonstration done in Quebec showed that in the event of a fire in with the same CLT panels, with temperatures reaching their highest, the fire would be contained to the compartment it started in, and even burn itself out in about two hours. Bryant told FFIC that the use of mass timber in the construction of the building is what made it safer than a stick-built structure. The building is being used to house university students living on the UBC campus this spring. Blaze destroys cedar mill in B.C.